Thank you to the Pentagon Chaplain for gathering us here for the Sikh celebration of Vaisakhi. I am honored to reflect with you on the Sikh tradition of service – seva – and what it means for us, here and now. We may be tempted to turn away from these crises of our time. But the Sikh faith calls us to face the fires of life, no matter how they rage – and respond. Service is the core of Sikh practice, but it’s not the kind of service we think we know. Seva is not safe. Seva is not easy. Seva means selfless service. To pursue a life of seva is to walk boldly into the hot winds of the world with a saint’s eyes and a warrior’s heart – and draw from a deep well of love to pour our body, breath, and blood into others. This kind of selfless service requires the courage of Mai Bhago, the 17th century Sikh woman warrior who told forty soldiers who abandoned their post during a great battle: “You will not hide from the fire. You will return to the fight – and I will lead you.” Donning a turban and mounting a horse with a sword in her hand, she led them when no one else would. Because seva means becoming the one you are waiting for. I believe that seva is the call of our time. Let me show you why. Five centuries ago in South Asia, Guru Nanak, our first teacher, found himself in a similar time of crisis – a time of violence between Hindus and Muslims, denigration of women, and cruelty towards the poor. One day, the story goes, Nanak disappeared by the river for three days; people thought him a dead man, a drowned man, but he had experienced a divine revelation and emerged with a single profound utterance on his lips: Ik Onkar, God is One; we are One. Guru Nanak was birthed anew. He began singing a song of Oneness – music and poetry meant to lift us into sacred experience. When we pray like that, our ego – haumai, the voice inside us that separates self from selflessness – starts to quiet. And something marvelous happens: we fall in love. “I see no stranger,” Guru Nanak said. “I see no enemy.” When we are in love, we begin to see with new eyes: we look upon the faces of people who are different from us and say: Brother. Sister. I cannot live if you are dying. I cannot stand by if you are suffering. That kind of love is revolutionary. When we serve the child, the parent, the family, the community, the country, we do so not out of obligation but because we love them; and in turn, that kind of love saves us. Only through seva do you attain God, Guru Nanak taught us. That means: we pray to remember God (simran) but we serve to realize God (seva). That’s why the way we serve matters, not with stress or despair, but with joy and boundless optimism called Chardi Kala. In fact, every Sikh gurdwara (house of worship) contains a prayer hall and a langar hall, a place where we cook and serve free meals, so that we can practice serving selflessly. Our first teacher called us to play the game of love. Two hundred years later, our tenth teacher showed us how. In 1699, Guru Gobind Singh called Sikhs to a clearing in a place in Northern India called Anandpur Sahib. It was another time of crisis. The Sikh community was struggling to survive onslaught at the hands of Mughal rulers. Our numbers were dwindling, and the future was dark. There stood the Guru – a warrior dressed in a tall turban, sword in hand, often seen with a falcon on his shoulder. He rose before the thousands with fire in his eyes, and called out: “Who among you is ready to give your head for the love of God and one another?” The crowd was silent. The wind rustled, and the people did not move – until one brave soul, Daya, stepped forward. The Guru took Daya inside a tent and a few moments later, emerged with his sword dripping with blood, and called: “Now, who else is ready to give their head for love?” Not a word was spoken. The wind rustled, and the people did not move. Until courage stirred within another, Dharam, and he stepped forward and entered the tent. The Guru emerged once again with the same call, again and again, until five had offered their lives. The Guru appeared once more, but this time, he opened the tent for all to see – and there they stood. They were all alive and well, but they were changed. “These are my Panj Pyare,” said the Guru. “My five beloved ones. These are the ones who were willing to offer their body, breath, and blood for the sake of love. The death of their egos has birthed them anew. The Guru gave them new names and anointed them, and was anointed by them in return. On that day, we as a community were also birthed anew. We too shed our old separate names and were given new names – Singh and Kaur, lion and lioness – to honor our equality and courage. We received the gift of five articles of faith, including long uncut hair, which men and some women wrap in a turban, so that we may never hide from the call to serve again. That is the story of Vaisakhi. That’s why we are here today – to celebrate our birth as the Khalsa, a spiritual sister and brotherhood, a collective body of beloved ones. Now, I have a confession. As a little girl, this story always made me tremble. After all, isn’t it madness to give up your life like that? But today, I see the story’s meaning with new eyes. Seva springs from a love so deep we would give our lives for it. When I gave birth to a baby boy a few months ago, and held my son for the first time, I knew that I would give my life for him. I looked at my own mother and saw all the ways she had poured her body, breath, and blood into me. What greater bravery, what deeper love? If the story of Vaisakhi calls us to serve selflessly, then perhaps motherhood is our most ancient and profound model. So today, as we celebrate Vaisakhi, let us honor all of those who teach us the truth of seva, the same way mothers and fathers show devotion to the lives of their children and their children after them. Let us honor our elders who teach us how to hold fast to our faith in the fire – like my grandfather Captain Gurdial Singh who followed seven generations before him and served in the military, fighting on the frontlines in World War II against Hitler’s armies. When his British commander told him to remove his turban, he refused, saying, “My turban represents my faith, and I cannot serve without faith.” So he went to war and when German aircraft swooped down and shot his best friend, he did not run. He wrapped his friend’s wounds with the cloth of his turban and brought him home. Because seva means leaving no one behind. Let us honor the faith and fearlessness of all our uniformed soldiers, including the Sikh Americans in this room: Corporal Simran Preet Singh Lamba, Captain Tejdeep Singh Rattan, Colonel Tina Kaur Sodhi, Staff Sargent Bree Kaur, Petty Officer Geena Kaur Sidhu, Senior Airman Jasreen Kaur, Private Sukhreet Kaur, and Lieutenant Jaspreet Kaur Saini. Let us honor Major Kamal Singh Kalsi, a decorated hero who when treating the wounded in Afghanistan, was moved to tears when one young bleeding soldier looked at him and said, “Thank you, brother.” Because seva inspires love in others. Finally, let us honor all the brothers and sisters in this room who are fighting for justice with modern-day swords – the lawsuit, the camera, the megaphone – not to vanquish others but to reconstitute the cultures and institutions that separate us. When Sapreet Kaur steers the Sikh Coalition to become the voice of a whole community, when Rajdeep Singh fights for our civil rights in the halls of power, when Gunisha Kaur sheds light on human rights atrocities, when Gurjot Kaur files lawsuits to challenge policy, when Ava Master uses online tools to tell our stories on the open Internet, when Ravi Bhalla responds to those in need as City Councilman, when Harinder Kaur Khalsa swears to serve her community as Deputy Sheriff, when Amandeep Singh Sidhu speaks truth to power in court, when Simran Jeet Singh wields his mighty pen, when Inni Kaur expresses the strength of truth in her voice, and when this week, my friend and brother Deeptej Singh stood with renowned LGBTQ advocate Sharon Groves just steps away from the Supreme Court to pray for the equality of all people – they show us what seva looks like in America today. Because seva means standing up for the dignity of every person, including those who do not look like us. That is why my friend Mayor Steve Scafiddi is here today. He has stood up for our community ever since a white supremacist opened fire in a Sikh house of worship in his city three years ago, leaving six people dead. The death toll would have been higher – it should have been higher – but one of his city’s police officers took seventeen bullets defending our community. Lt. Brian Murphy, a former marine, was willing to offer up his life to save people who did not look like him. When Lt. Murphy was shot to the ground that day, he thought of the people inside the gurdwara and kept moving in order to give the gunman a target. When he felt death lulling him to sleep, he thought of his wife and children and willed himself awake. And when help finally arrived and he was rushed to the hospital, he kept asking after his fellow police officers. His service was not any single act; it came from his way of being. Sikh values are American values. 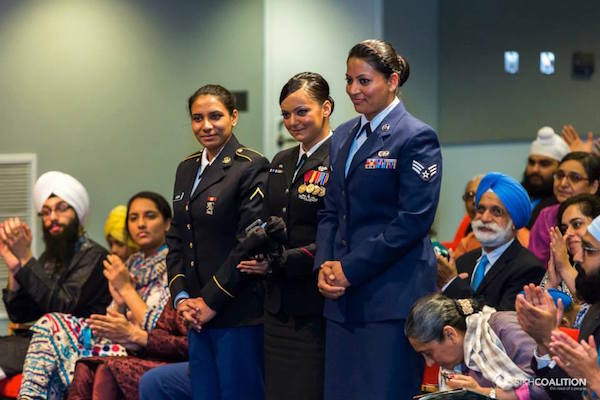 The Sikh tradition of service captures the best of America. 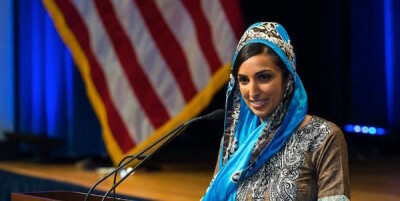 Seva calls us to look upon the faces of people who are different from us as our own brothers and sisters – whether Black, Latino, LGBTQ, Muslim or Sikh. Seva calls us to the burning city streets, to the steps of the Supreme Court, to the halls of the Pentagon, so we can show that all lives matter. All lives matter. Which brings us back to where we began: Seva is the call of our time. When I look at my son and all I hope for him, my throat catches. I know if he chooses to love like that, to serve like that, he will not be safe. But it is the only way to truly live. “Courage is fear that has said its prayers,” says my friend Bishop Gene Robinson. So I draw my son close and whisper in his ear the prayer my grandfather taught me: “Tati vao na lagi” – the hot winds cannot touch you, not when you walk the path of true service. Even if you are beaten down. Even under a rain of fire. Even if you are bleeding – in the birthing room or on the battlefield – the hot winds cannot touch you. Because you are with the holy, and of the holy. You are with God, and of God. You are with love, and of love. And that kind of love saves us all. ORIGINAL ARTICLE WAS PUBLISHED HERE.